Domestic violence (DV) is frequently understood and responded to as an interpersonal issue. 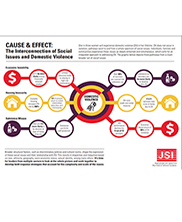 This research-based infographic places DV in a broader social context by depicting the pathways to and from DV and three social issues: economic instability, housing insecurity, and substance misuse. The graphic is intended to serve as a reminder that DV does not occur in isolation, that social issues such as these are entwined and simultaneous in families and communities, and that moving the needle on DV requires solutions that respond to this complexity. English- and Spanish-language versions of the infographic are available for download.